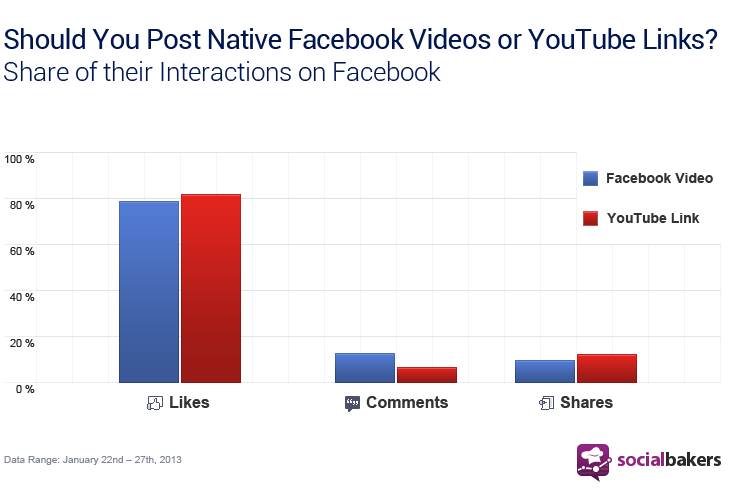 Facebook videos or YouTube videos – which perform better on Facebook? The following is a guest post by the [insert superlative of choice here] John Haydon. It originally appeared on his blog and is reprinted with permission. But should you upload videos to both places? Or, should you upload videos to YouTube and just share the link to the video on your Facebook page? According to a recent study by socialbakers, videos uploaded to Facebook achieved a 40% higher engagement rate over YouTube links posted to a Page. Their analysis of 3,684 YouTube links and 458 Facebook videos also found that both receive the same amount of likes and shares, but Facebook videos receive more comments. How should you post your videos? According to this informal poll about using Facebook or YouTube, most people prefer Facebook for a number of reasons. Facebook videos cannot be shared outside of Facebook. YouTube videos to be shared anywhere. Both videos can be embedded in webpages or blog posts. Facebook users tag their friends in Facebook videos but not YouTube videos. Facebook videos can be viewed in one tab on your page. In order to view your tubes within a single tab requires a third-party application. How do you post video on your Page?